While the possession of weapons, including for military use, is widespread in Switzerland, crimes with firearms are so few that there are not even statistics about them, the BBC reported. With a population of six million, the country has at least two million private firearms, including about 600,000 automatic assault rifles and 500,000 pistols. 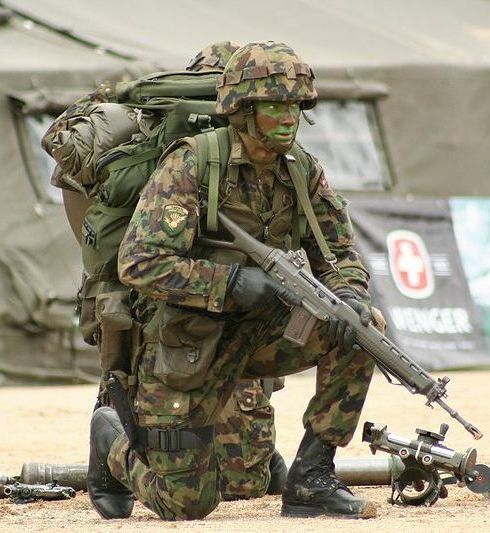 Switzerland has a unique national defense system which it developed over many centuries as an authentic tradition. The country requires every man to belong to a regional militia and to receive training for a few days or weeks per year during almost his whole life. Between ages 21 and 32, men serve in the regular troops and receive an M-57 assault rifle and 24 clips of ammunition they must keep at home. Later they become part of the regional militia, which also require some training, in addition to keeping the weapons at home. In addition to the government-provided weapons, there are almost no restrictions on gun purchases or sales, though some cantons limit bearing rights in some cases. Firearms are “anchored” in Swiss society to the point that controlling them is not a problem or a public issue. A sense of collective responsibility dispenses with the need for gun laws. The government sells excess weapons to the public, especially when the army adopts new models. Public buildings have little police protection. Yet, in spite of the massive numbers and availability of firearms, crimes practiced with them are extremely rare. Mark Eisenecker, a sociologist at Zurich University, explains that firearms are “anchored” in Swiss society to the point that controlling them is not a problem or a public issue. Swiss reality proves that the possession of firearms is not the cause of the crimes committed with them, just as possession of a kitchen knife is not the cause of a bloody crime perpetrated with it. 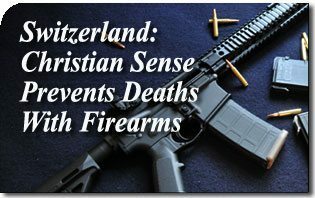 Several commentators believe that an explanation to the Swiss case is found in the fact that Switzerland lacks the social problems related with crimes with firearms in other countries. There is little drug consumption nor does it have near the urban decay found in other countries, even in rich industrial countries. A sense of collective responsibility dispenses with the need for gun laws. Furthermore, Switzerland has also preserved great familial, social and historic-cultural unity. The Sturmgewehr 90 assault rifle is issued to every man in the Swiss Army, and he must keep it with him at home. From their earliest infancy, Swiss men and women are raised with the idea that firearms are made to defend their country. These natural explanations acquired their present relevance after many centuries under the influence of Christian Civilization, which profoundly shaped the soul of the Swiss people. The day this influence ceases under the blows of rampant secularism, Switzerland will also suffer from the ills of crime and state encroachment now plaguing de-Christianized countries. This entry was posted in News Commentary and tagged assault rifle, BBC, Christian Civilization, crime, crimes, firearms, government, M-57, Mark Eisenecker, military, pistol, society, Swiss, Switzerland, weapons, Zurich University by Luis Dufaur. Bookmark the permalink.